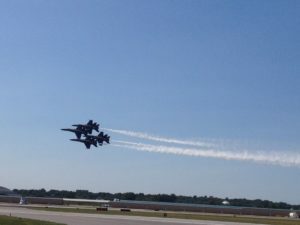 Save this date, the weekend after the 4th of July, 2019 the Navy Blue Angels will be performing at the Downtown Wheeler Airport in Kansas City, MO. 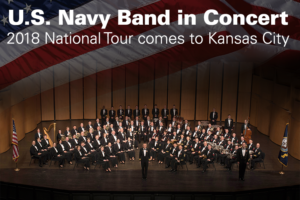 As an Alumni Chapter we will partner with the Navy League, the USS Kansas City Commissioning Committee (LCS-22), and the Association of Naval Aviators to have a private viewing of their practice session on Friday, July 5 sometime early that afternoon on the tarmac of the Downtown Airport, and meet and greet with the pilots and crew. You may want to put in for personal time off (PTO) of work that day to attend the special session up close and personal. 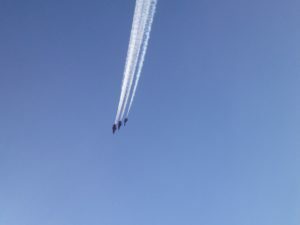 The public performances will be on Saturday and Sunday. Several members of the USNA Greater Kansas City Metro Chapter attended a grand luncheon event honoring actor Gary Sinise with the Col. Roger Donlon Patriot Award. 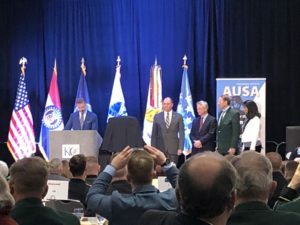 We were behind enemy lines with the Army—-the AUSA (Association of the United States Army) on February 25, 2019, at the Downtown Marriott in Kansas City, MO. There were over 400 in attendance total. Included Navy USNA alumni mingling with the Army were: KC Chapter President Bob Culler ’74, Chapter Treasurer Jack Rush ’73, Board Member Chuck Stevens ’73, Board Member Eric Carlson ’74, Board Member Captain Mike Gochis ’90 (SelRes still wearing the uniform), Board Member Bryan Didier ’91, Retired Captain Dale Puhrman ’73, and Stu MacArthur ’84. Also attending was Honorary USNA Chapter member RADM Jeff Penfield, USN, Ret. and his wife Cynthia. Admiral Penfield is the only Navy Flag Officer living in Kansas City, and is Executive Chairman of the USS Kansas City (LCS-22) Commissioning Committee. 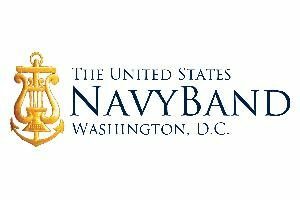 When it was announced in Gary Sinise’s biography that the U.S. Navy had previously made him an Honorary Chief Petty Officer, the whole Navy contingent cheered loudly. Sinise’s own father Robert Sinise, was a Navy Photographers Mate in the early 1950’s, it seemed most appropriate. Actor Gary Sinise’s has a new 2019 book out entitled Grateful American, A Journey From Self to Service. Gary Sinise is with AUSA President and Exec. VP and Col. Roger Donlon, 1964 Vietnam Medal of Honor Recipient. The Patriot Award was presented in Col. Donlon’s name. Reservations should be made at http://www.cvent.com/d/bgqj3h. We recommend making reservations at the earliest for guaranteed seating. Please note that this is a joint service academies event to which graduates of all the service academies, parents of service academy cadets and graduates, military veterans, supporters of the military and guests are all invited. We look forward to seeing you there and celebrating our military’s and country’s histories. Speaker: None. 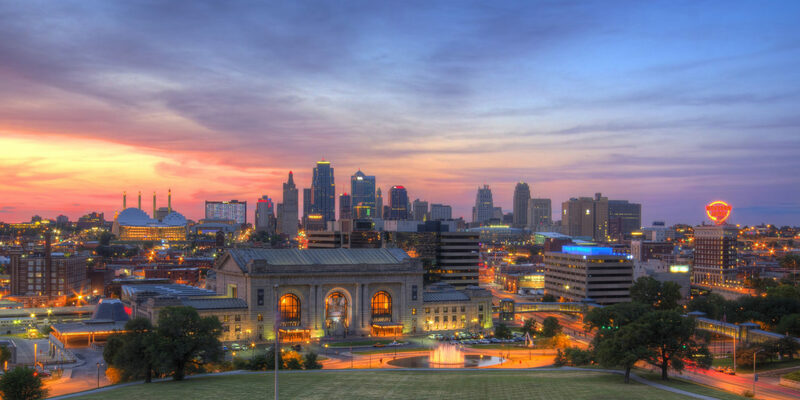 To get your personal input on 2018 possible plans and activities: regular monthly or quarterly luncheons, golf against West Point and Air Force, other joint service academy events, Fall USNA founders day dinner, getting local chapter 501c3 non-profit status, football watch parties, Royals game, Memorial weekend Sunday concert @ Union Station and joint dinner like 2017, possible fly away to Notre Dame game in San Diego on 10/27 or SMU game in Dallas on 9/22 (hotel, tickets) etc. Treasury report. RSVP: Bob Culler by February 24 bob.culler@1974.usna.com or text to 913 488-6319. The room upstairs seats 12 comfortably so please RSVP in case I need to move us to a larger room. Thanks. I know this is very late notice but if anybody wants to escape your own man or woman caves this afternoon and watch the Navy SMU game on Veterans Day November 11, a few of us KC alumni are informally gathering down at the Granfalloon Bar and Grill down at the Country Club Plaza around 2:00 PM. I don’t have a room reserved or anything formal. So wear something with Navy on it so we can recognize you. Here is the address: It is facing Brush Creek just beside Plaza III Restaurant. The game is on TV on the CBS Sports Network at 2:30 PM. Go Navy Beat SMU. Happy Veterans Day to each of you! Families are invited to a new type of event for us. Don’t miss this fun time to get to know each other. 1) Bring your own picnic basket for your family. 2) Huge Smores, soft drinks, water and KCWineCo wine are available for purchase on site. 3) Picnic tables will be available; however, lawn blankets should be brought just in case we run short of tables. 3) The Vineyard Olympics yard games for the family and kids will be available; AF-Army-Navy competition is welcomed. 4) Bring your own yard games (i.e. Badminton, etc.) as well. 5) Bring cameras and bug spray – it is the country. 6) KCWineco is owned and operated by fellow USAFA graduate Kirk Berggren (’86) and his family. Kirk is making a special effort for this event on behalf of our service academy associations. Make sure you enjoy a bottle of one of the many wines KCWineco is now producing. Invitees: Members of the associations of graduates from all service academies, former military veterans and military members, members of the parents’ club of cadets, and family members. Don’t forget the kids too. Parents of prospective midshipmen (cadets) are also invited as well as the candidate him/herself. Cautionary Note: The winery and vineyards are open for viewing but this is a working operations. It does have barbed wire, poison ivy and an unfenced pond outside of the customer area. So monitoring of children is absolutely mandatory to prevent them from getting into areas that are off limits and not safe.